There is a significant passage in St. John’s Gospel (17:1-19) where Christ, after a discourse with His Apostles about His pending hour of death, lifts His eyes toward Heaven and proclaims a prayer of sacrifice before God, affirming His journey as the lamb who will be slain for the salvation of all humanity. This public act of prayer in word and deed provides us with insight on the way we are called to worship and celebrate Christ’s crucifixion and resurrection. 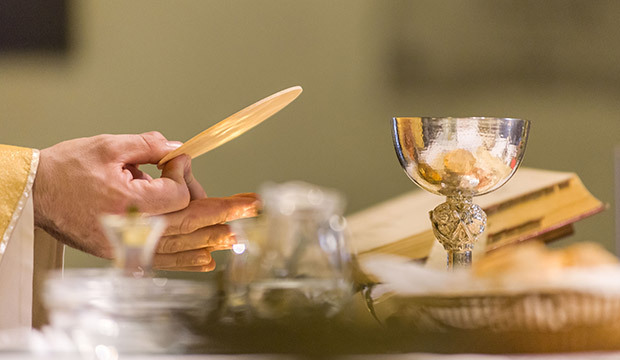 Two simple yet profound terms typically associated with how we worship as Catholics are the Mass which means “to send” and refers to the celebration of the Eucharist established by Christ at the Last Supper. The liturgy refers to the public work or way we come together as one community to worship Christ. Both the Mass and the liturgy direct us toward an active participation in the work of God by openly reaffirming the sacrificial life, death, and resurrection of Christ. The significance of the Mass is that it offers a renewal of what Christ did in sacrificing Himself for our sake, meaning the salvation of humanity. Thus, the principal premise of the Mass and our liturgical demeanor is directed toward Christ and nothing else. Something all of us should consider in both our communal and prayerful participation in the Mass and liturgy is whether we desire an awakening of our faith in Christ and His Church. During Mass why do we sit, kneel, stand, and cross ourselves with holy water? The premise of those postures is really to put focus on the sacrifice of the Mass. So when we kneel we’re giving glory and honor to Our Lord. When we genuflect we’re actually assisting and assenting to the presence of Christ in the tabernacle and on the altar as well. And so when we make the sign of the cross, we’re recognizing that we, as Christians, are coming into our liturgy to celebrate and commemorate the sacrifice of the Mass. Standing is a posture that was implemented in the early Church before kneeling. It was a proper reverence, back from the time of St. Justin Martyr in 158 AD of recognizing the presence of Christ at the sacrifice. Why does the priest wash his hands during Mass? Because a priest acts in the person of Christ. 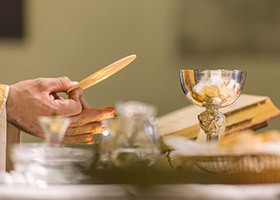 It’s important that when he handles the elements of bread and wine he purifies his hands, which is part of the old Jewish ritual of purification in preparation for the holy sacrifice or entering the Holy of Holies. So it’s a sign of cleanliness, of cleansing, and of purification prior to handling the element in the Mass. How did the ritual of the Mass originate? If you go back to Old Testament times, we see the whole issue of the sacrifice or altar with Abraham and Melchizedek in Genesis 14, and then we see that commemoration as well in Exodus with Moses and the high altar and the conversion of the Holy of Holies culminating with our Lord at the upper room at the celebration of the Last Supper which we find in Matthew 26. Why does the priest kiss the altar during Mass? The altar is the altar of sacrifice and it’s the altar of remembrance. And so for the priest acting in the person of Christ he gives significance to the altar itself for what it is as a sacrifice, but also as a tomb that represents Christ on the cross, but also His death and His resurrection, hence the kiss on the altar. Why is it necessary to go to Mass? It’s a great question. Christ instituted the Mass for remembrance or commemoration of His redeeming work on the cross. So we go to Mass to really celebrate not only His sacrifice and His life and death, but also to recall what He did for us not only on the cross, but through the Church. He established the Church in order for us to go and celebrate the beauty and the mystery of who He is. Lenten staple prompts a grammar debate: Are they fish 'fries' or 'frys'?